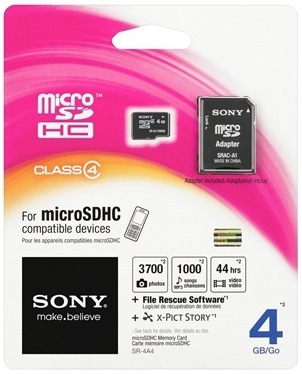 Sony Electronics is expanding its industry leading line of consumer media with the addition of five new SD/SDHC memory cards for digital imaging products, and three new microSD/microSDHC memory cards for mobile phones. The new SD/SDHC and microSD/microSDHC memory cards, which — except for the microSD 2GB card – are all class-4-speed for high-definition recording, include unique benefits for consumers. Easy-to-use animated picture sharing software (x-Pict Story) is available via free download and allows consumers to create animated slide shows of their pictures set to the music of their choice. File Rescue software is also free via download, and helps consumers recover accidentally deleted files. “The new cards will complement Sony’s existing Memory Stick line, satisfying the needs of a broader range of users, and strengthening Sony’s position as a full line media supplier,” said Shane Higby, director of the consumer media business at Sony Electronics. Sony will continue offering a full range of Memory Stick media for consumer and professional products, to support and enhance features such as stable recording or high-definition video, high-speed burst shooting and high-speed data transfer. 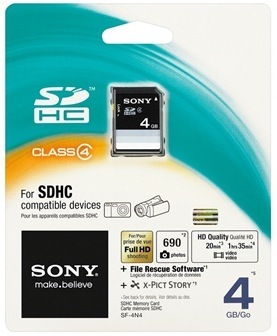 Memory Stick is the recommended media for Sony products, offering a range of unique benefits. For example, the high-speed “HX” Series’ capabilities are optimized when using the burst shooting mode in Sony’s α (alpha) DSLR cameras, as well as high-speed archiving of high definition movies shot with Handycam camcorders and Cyber-shot cameras.